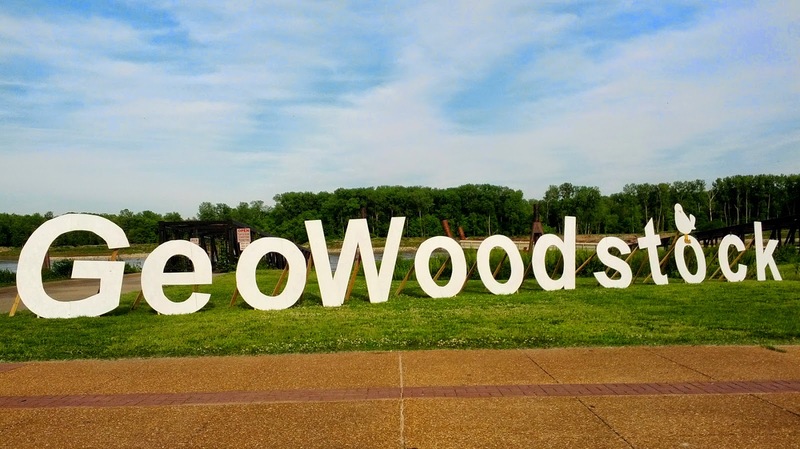 Today, on the shores of the Missouri River in St. Charles MO was held one of the classic geocaching events: GeoWoodstock. GeoWoodstock is a mega event, where thousands of geocachers come together for a day of fun, fellowship, and geocaching. I have attended 4 GeoWoodstock events to date (IX, X, XI, and now XII). Each GeoWoodstock has its own flavour, and this one was no exception. 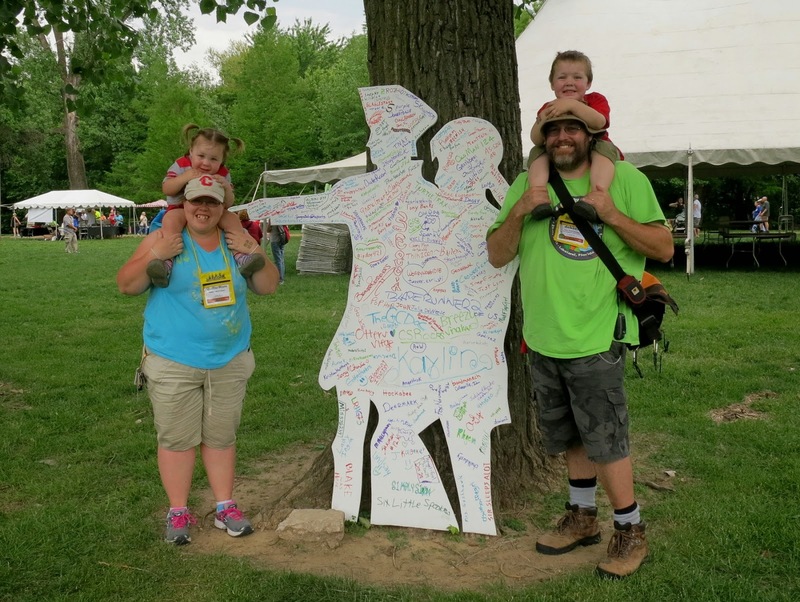 The theme of this GeoWoodstock was Louis and Clark, the famous explorers that helped map the western side of the United States. Their expedition, known as the Corps Of Discovery, left from St. Charles in 1804. 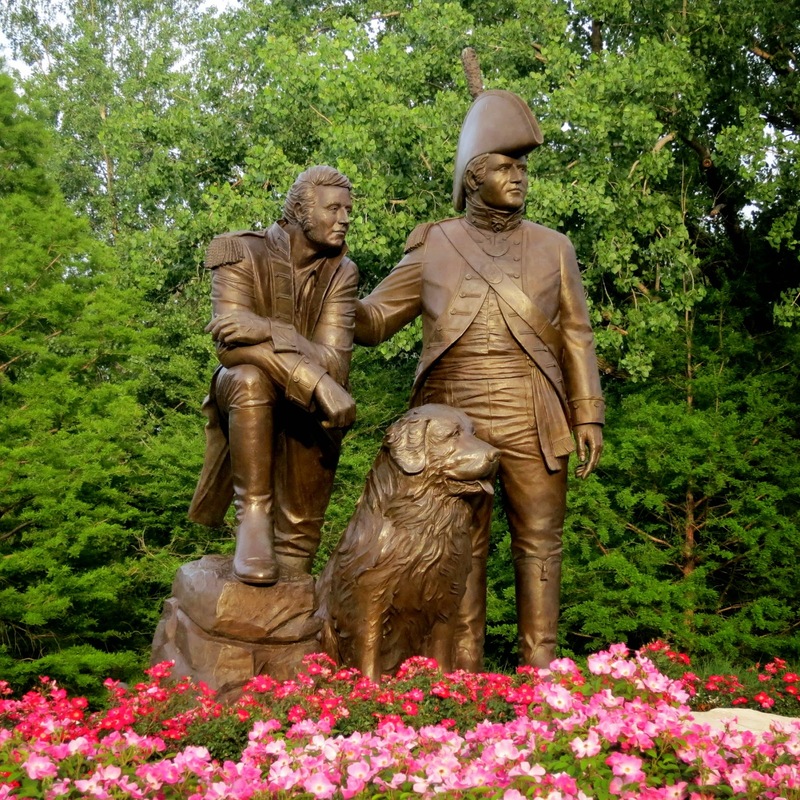 Very few things provide more inspiration to a geocacher than stories of explorers like Lewis and Clark. I have written extensive blogs on my previous GeoWoodstock experiences, so I'll concentrate on the things that make this event unique. 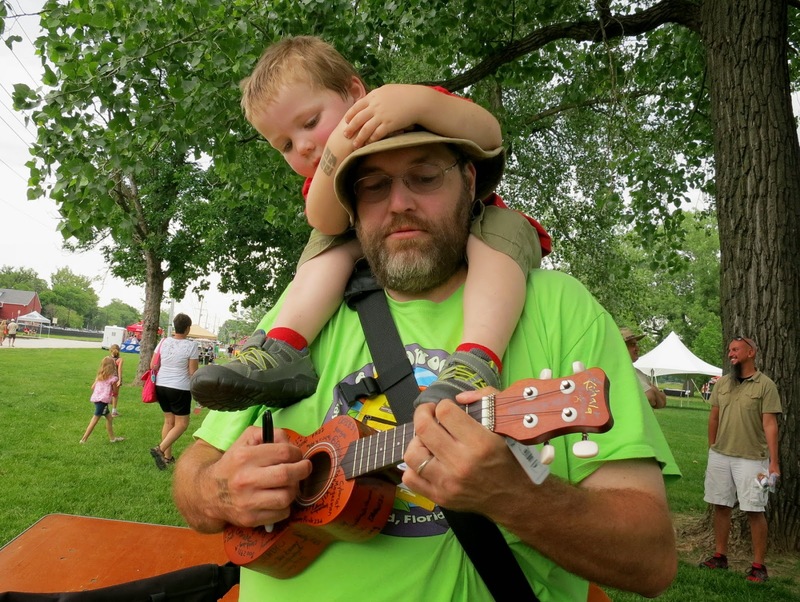 The first notable thing is that this GeoWoodstock was held in downtown St. Charles. On one side of the park is a large river, on the other is a rustic and historic town. Most events like this are held in out-of-the-way places where access to restaurants and other such things require a car - this one had food and fun literally across the street. Another notable thing is that we did not have the park to ourselves. On the northern end was an Irish music festival. To be honest the fact that the festival shared the park with us made me a little nervous - mainly due to the extra people would dilute from the fun and flavour of the event, and parking would be hard to come by. As it turns out the Irish Festival fit into GeoWoodstock like a glove. Parking did end up being a bit of an issue, but there were enough spaces for everyone if one was willing to walk a half mile or so. However the upsides vastly outweighed the (trivially) bad. The availability of fair food is the first perk. Nothing seems to taste as good as food from a truck. Second is that it made a great distraction for the kids. This is the first GeoWoodstock where my wife and I had to manage two toddlers (the previous 'stock we had one as Abigail was only 4 weeks old and didn't move much). Going in I was worried about keeping the kids entertained for the entire day. The festival provided all sorts of kid distractions, including music and a midway. It was truly a blessing in disguise for us poor parents of toddlers. Hanging out at the log book. Speaking of music, this is the first GeoWoodstock I have attended that had a DJ. They played rock music during several parts of the day, which added a nice backdrop. This may, or may not, have contributed to some dancing and air guitar playing as we walked across the park... unfortunately no photographic evidence exists. Also, speaking of kid distractions, (back up a paragraph or two to catch this thread :) this GeoWoodstock also had many activities for kids. The most noteable is a set of 12 caches specially decorated for kids that were loaded with swag. We spent a good two hours hunting down these caches. I'll cover these in a follow-up post, but it was awesome, and I hope future 'stocks do similar things for the kids. - Hanging out with the Geocaching mascot, Signal The Frog (tho we've discovered that, while she loves the toy Signal we have at home, Abigail is freaked out by the full sized version - kids be crazy). - Many seminars, including my favourite, Meet The Reviewers, where us mortal geocachers can ask the reviewers (the people responsible for publishing caches, including the hard work of ensuring they meet the guidelines), pretty much anything. This years panel was especially interesting. Of course, at the end of the day, when all the fun is winding down, the tradition of announcing the next GeoWoodstock location continues. I was very happy to find out that next years GeoWoodstock will be in Maryland, since it is within a days drive of my home. One of the most notable things this time was all of the people I got to meet, mostly for the first time, that I previously only knew from Google Plus, or podcasts. I actually spent a lot of time walking up to people I've never set eyes on, but talked to online, and getting instantly recognized. 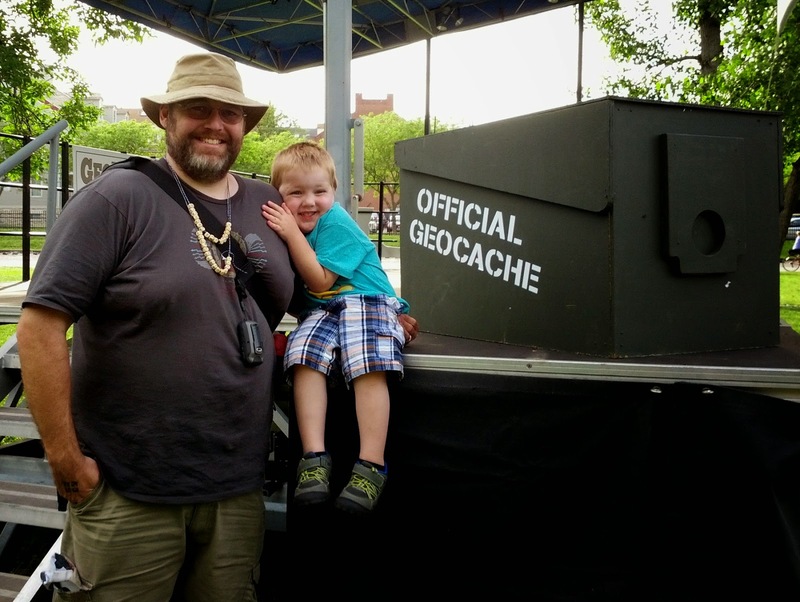 Being recognized sight-unseen is odd for me, but its a good feeling - makes the Geocaching world feel like a large family. I also met some fans of the blog, and recognized me from when I co-hosted the Geosnippits Reboot podcast. One person stopped me to personally thank me for my Mega Event Survival Guide. This is all to say that this GeoWoodstock ended up feeling like an extended family reunion, and for someone introverted like me, thats an unusual and special thing. I am already scheming about next years event in Maryland. I've already checked with my wife, and she has given me permission to post my Will Attend log, which I will do as soon as the cache listing is posted. So, if you are a geocacher, I hope to meet you at the next GeoWoodstock in Maryland. You are going to be there... right? RIGHT?! ?